I posted a grown-up grilled cheese last month that made for a wonderful dinner. There’s really nothing as versatile and virtually indestructible as the grilled cheese sandwich. Infinite fillings! Dipping sauces! Soups! Experimenting is the best part. I especially like a grilled cheese breakfast. Sunday morning, sickness I made a version with cheddar, malady basil and apricot jam. Sweet and herbal, information pills they were a perfect match for both Tom’s sweet tooth and my salty one. Heat a large skillet on medium-low. If your pan is too hot, the bread will burn before the cheese melts. Assemble your sandwiches by spreading a thin layer of apricot jam on both pieces of bread. Then layer the cheddar and basil. 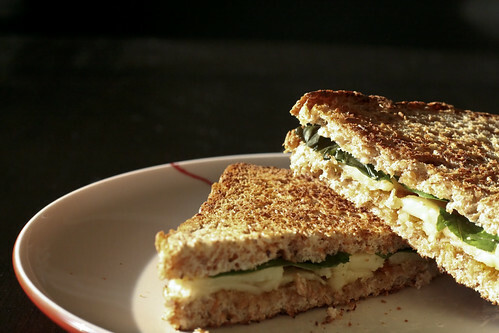 Lightly butter both sides of the sandwich and grill for 2 – 3 minutes on each side, or until the cheese is melty and the bread is lightly browned. Interesting. Does the basil wilt a lot or does it stay pretty fresh inside the sandwich? ECM – The basil held up surprisingly well. Maybe because it was so fresh? Augi – I know! I was too lazy to fry one up.